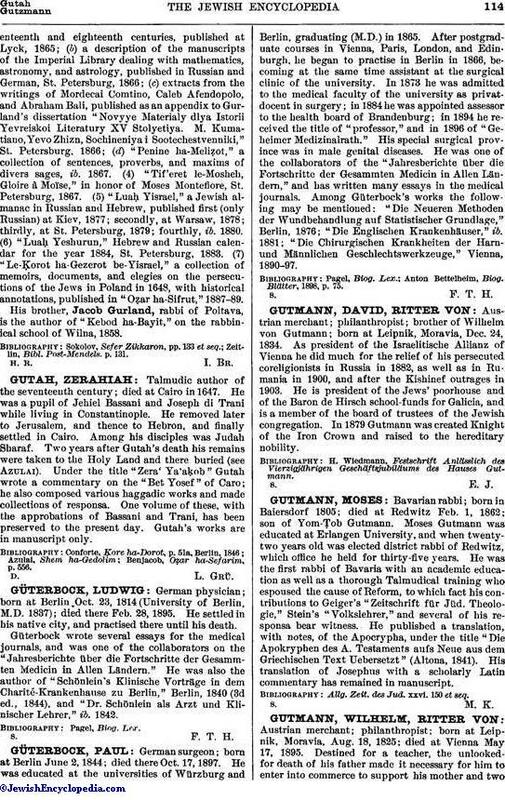 Bavarian rabbi; born in Baiersdorf 1805; died at Redwitz Feb. 1, 1862; son of Yom-Ṭob Gutmann. Moses Gutmann was educated at Erlangen University, and when twenty-two years old was elected district rabbi of Redwitz, which office he held for thirty-five years. He was the first rabbi of Bavaria with an academic education as well as a thorough Talmudical training who espoused the cause of Reform, to which fact his contributions to Geiger's "Zeitschrift für Jüd. Theologie," Stein's "Volkslehrer," and several of his responsa bear witness. He published a translation, with notes, of the Apocrypha, under the title "Die Apokryphen des A. Testaments aufs Neue aus dem Griechischen Text Uebersetzt" (Altona, 1841). His translation of Josephus with a scholarly Latin commentary has remained in manuscript. Allg. Zeit. des Jud. xxvi. 150 et seq.